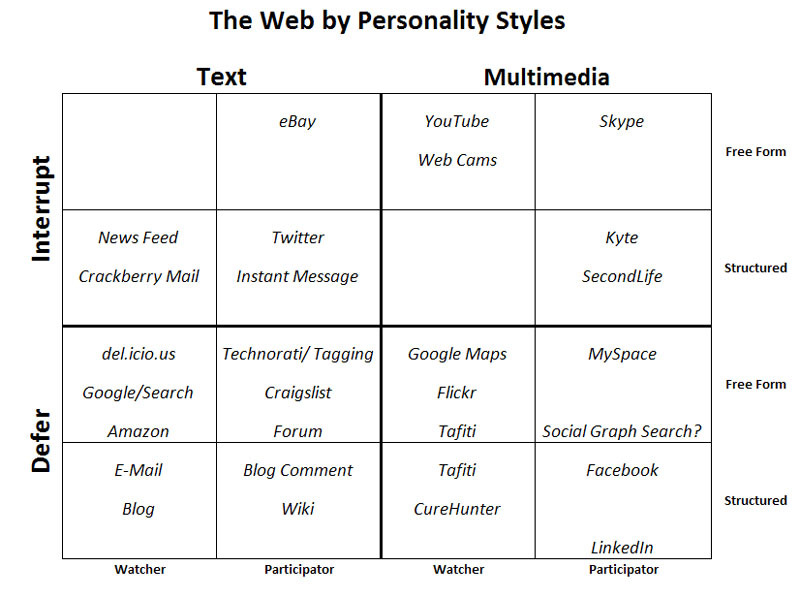 Since my original post on Web 2.0 Personality Types, I’ve been exploring the idea that a set of traits, similar to what one finds in personality tests like the Myers Briggs, might lead to an understanding of why people have strong preferences about their styles of interaction on the Web. Let’s quickly try to slot in some of the vast plethora of sites and activities one can perform on the web using the same categories as the original article save one. I’ve left out the simple vs rich UI and instead factored that into Text vs Rich media. The reason is that its hard enough to show 4 dimensions in a 2 dimensional diagram let alone 5! You can see the various dimensions along the edge. To see how to read it, E-mail is classified as Text+Defer+Structured+Watcher. Most email is Text, although you can embed things in it. You interact with email on a Deferred basis at a time of your choosing, unless you are a Crackberry Mail adict (hence it is in the “Interrupt” quadrant). E-Mail is structured as a pretty rigid timeline or send based thread. 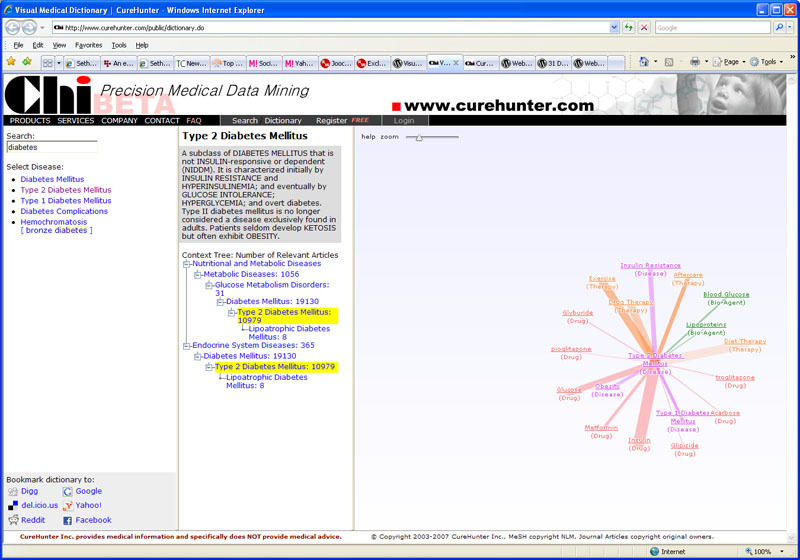 Free Form sites are often those for whom the primary structure is search. I also regard Tagging as a variation of search and hence it is classed as “Unstructured”. There is a lot of structure to search, and it’s often very illuminating to have the ability to see and traverse that structure, yet not every likes it. OObject is another great case study that lives near a Seam in the matrix (watch out Neo!). It’s kind of a visual blog, however, there is a participation angle too. They pitch photos at you of objects that are interesting. The participation angle is that your “Blog Comments” are primarily votes and the most interesting way to use the site is to look at the rankings of objects by vote rather than to try to grok the individual objects coming at you. Looking at this thing, I’d think it might benefit from a Visual-Twittery-Interrupt Feed so you can just let it run constantly in a widget, pausing when something cool catches your eye. You can create twists on services using this concept as well. Start with a successful service like FlickR: Multimedia+Deferred+FreeForm+Watcher. Now let’s change one dimension. If we change Multimedia to Text, we go from FlickR to Scribd. FlickR shares photos while Scribd shares documents. Here’s another. Dale Dougherty wonders what would happen if it become common practice to update blog articles with new developments (have to look at how Blog Readers respond to that for a start). He envisions writing news articles and attaching mini-blogs to them so that each one updates. This is a great idea, because once a link graph exists to take you to the article, why should you have to find a new article to keep up with the story? At the least, why not add a link to the new or related story to the blog entry. But hasn’t Dale just morphed the Blog’s Text+Deferred+Structured+Watcher style over to more of a Text+Interrupted+Structured+Watcher? It isn’t quite interrupted, but the blog now has more of a real-time aspect about it. It would be more like Kyte with Blogs instead of videos perhaps for the most Interrupted style. That is, a blog with a Twitter box attached at the bottom. Search is a good testing ground for playing with these ideas, so let’s try to make up a new Search application using the Personality Traits. I want a search engine that is Textual+Interrupted+FreeForm+Watcher. Hmmm, sounds like I just described the FBI’s CARNIVORE software, or at least the popular Tom Clancy-esque view of it. We’ve got software monitoring email coming from tons of sources so its textual. 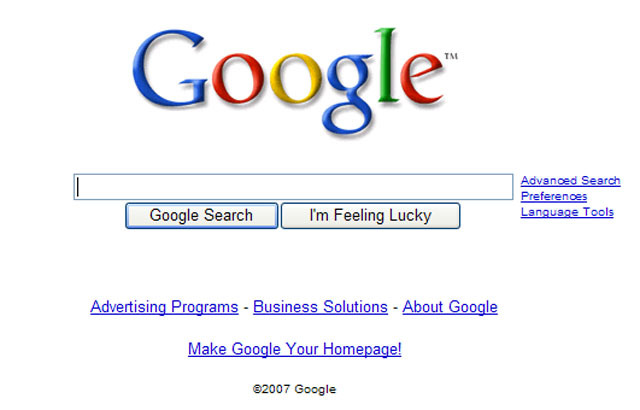 It’s free form, meaning that presumably all manner of arbitrary search triggers can be inserted. There’s no participation as ideally the FBI doesn’t even want the participants to know they’re being watched. And presumably, its interrupty. I have visions of a master control room with a bunch of guys looking at screens. When the right combination of “bad” words comes up, an operator pushes a button and black helicopters are dispatched to deal with the situation. I’m being a bit tongue and cheek here, but you can easily imagine Wall Street using this sort of thing to sift through news and trade on the results all day long. This process of being able to shift just one or two of the dimensions and find another service that makes sense gives me hope that there’s something real to the idea. It feels right to be able to make sense of the inter-relationships of these services, rather than to just assume new services can be invented ’till the cows come home. Unfortunately, it’s also very subjective, and I’d appreciate any feedback folks can give to better position services in the matrix. For example, I’ve got Facebook and LinkedIn as Structured and MySpace as unstructured. LinkedIn is below Facebook because it seems even more Structured. Lots of trade offs and gut decisions, but it seems to make sense. I haven’t yet come up with something for every box. Who knows, perhaps some boxes are not fertile combinations, but it is interesting and fun to twist the Rubic’s Cube and see what pops out. 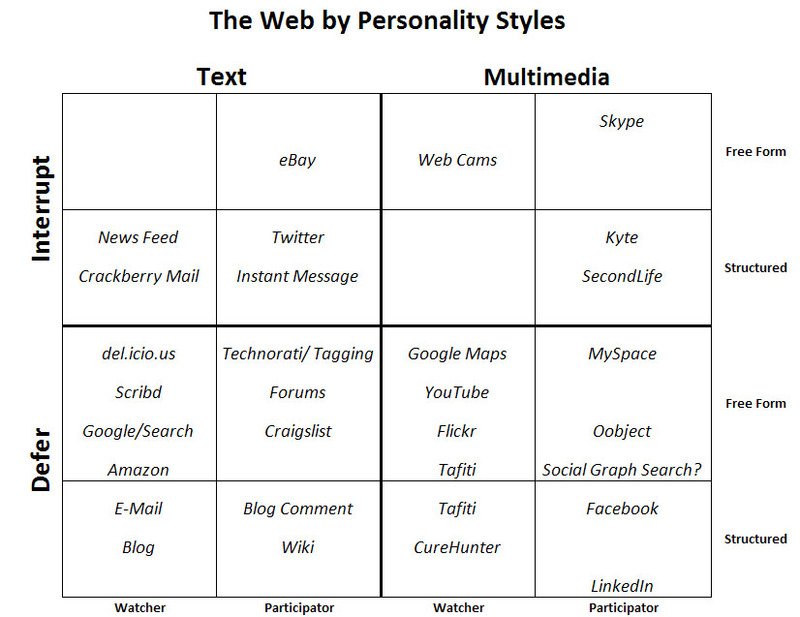 Next article we’ll look into how you go about reaching all these personality types with your own Web 2.0 initiatives, although that’s probably becoming more clear as you look at the map here.